eCommerce Website Development| How to build an eCommerce website? Shopping spree, shopaholic, shopping addicts, and whatnot!!! So many terms and all thanks to the era of online buying. 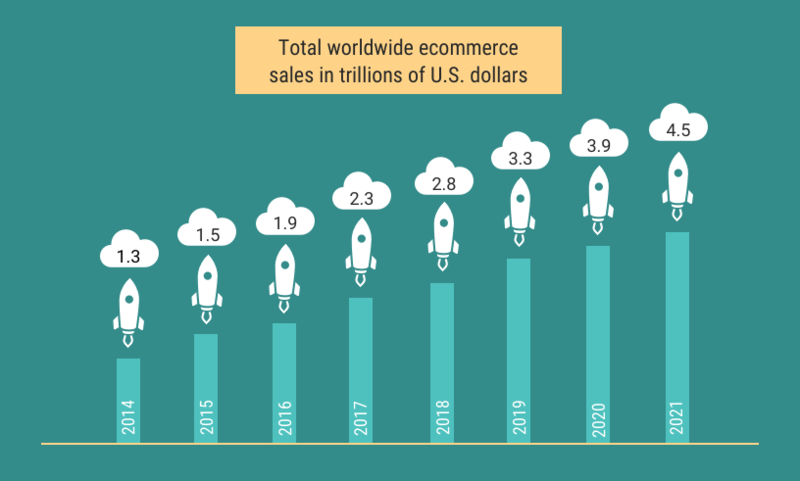 The growth of eCommerce is out of the world. Global retail e-commerce sales is expected to reach $4.5 trillion by the year 2021 (Source). People simply love to shop; regardless of the time; regardless of the place they are in. According to the US Small Business Administration, online businesses are growing more popularly as compared to the conventional brick and mortar stores. Everyone from local retail shops, DIY craft makers, and even bloggers are opting for digital medium to sell their goods and services to worldwide buyers. Digitalization has revamped entire brick and mortar arena into eCommerce wherein people shop their favorites in the comfort zones of their home. Thanks to the ease of digital marketplaces combined with smartphones and personal computers. After all, no one would want to spend the most precious weekend standing in the long queues at billing counters waiting for their turn while their favorite team is playing a soccer match against one of the deadliest opponents. Owing to the e-commerce revolution, big players like Amazon, and other counterfeits like ebay, Wayfare, and others have made their way to the mainstream, while supermarkets and malls have gone limited to “Selfies Zones”, “Window Shopping Fads”, “Check-in hangouts”. Now all you gotta do is, launch your favorite online marketplace on the smartphone or personal computers and get the ball rolling. As simple as that!!! Owning a successful business that attracts a lot of money is a dream of every businessman out there. The idea of customers hovering around every corner and counter of your shop is one the most amazing sight you can ever think of. eCommerce web applications help you realize this dream into reality. And that with the added advantage of introducing your business to the worldwide shopaholics without you actually having to travel miles just to market your products. Not only this, with more and more innovative technologies like AI and VR making their way into e-commerce, this realm of business is not going to take a back seat for many years. These trends have inspired businesses to take a digital route for their business and many budding entrepreneurs are now on a lookout for an e-commerce website developer. In case, you are one of these, well, you have landed up on the right page. With a shining vision of a brighter future, now is the time you should be taking your plan e-commerce solution development seriously. To begin with, start laying out your business goals precisely. Who is going to be your target market? What is your product going to be? Which brands are you targeting? Who are your competitors? Once sorted with this, it’s now the right time to lay out the features that you would want in your e-commerce website. This is the most crucial step of the process. Features directly reflect the USP of your marketplace and something that makes your e-commerce website stand out. Here are some of the features that can truly enrich your e-commerce websites and the ones you cannot afford to miss at any cost. Filling out long registration forms that ask minutest user details is really exhaustive. With loads of information to fill in, all users end up doing is giving up and moving on to the marketplace that understands how to get the information in minimum efforts. Who has got the time anyway? The best thing to do here is to make sign up as convenient as possible. You can also try to sign up via social media accounts rather. Two clicks and your customers are onboard! Simple, isn’t it? What else? You’ll get to earn extra brownie points for learning user preferences through their digital age on the social media platform. Your customers have needs and requirements, you have the products. Did you win the game? Probably not. Why? The customers don’t probably know that you have the products you have been looking for. So, how can you bridge this gap? Web Push Notifications are the key! They are the simplest way to map the success of an e-commerce website with the ability to keep customers engaged and informed about the referrals, discounts, sales, promotions, offers, and anything that you want to tell your customers about. Moreover, this opens gates to cross-sell and up-sell to bring in more profits. Social media integration in your e-commerce website is not just related to that, but more. It takes you to every place where your customers are, Facebook, Twitter, Pinterest. You name, and it hs it covered. Not only this, but social media will also help you leverage word of mouth marketing by enabling your customers to share special discounts and offers on their profile. Yeah, as attention seeking as it might seem. But being into business, you are just. You have an idea for an exciting new feature that has the potential to strike chords with your users. The feature seems pretty amazing to not only add value to the customer’s experience but also bring in great enhancement to the RoI. But is it really useful if it doesn’t come well-in-time? On the other hand, let’s assume you have 10 products in your store and a user buys off 5 of these. Well, you cannot simply wait for another day just to update the inventory records. After all, you never know who might end up buying another 10 without you actually having scope for rest 5. Thus, maintaining the synch is typically important here. Not only should you ensure that the mobile and web versions of your website are in proper synch, but also guarantee that backend of your website works in great synchronization with the front-end. Well, AI has been disrupting every industry as of now e-commerce is no exception. And when it’s available, why not make the best use of it by getting your e-commerce website the edge of AI and machine learning. Learn about your customers while digging deeper into their behavior. Offer them with products curated to their choices. How many times have we ourselves bought a pair of jeans, just because it appeared on the suggestions alongside the shirt we recently added to the cart, or may be new headphones to match up with the advanced smartphone we bought? Many a times, isn’t it? And so have your users. Give it a try. Shying away from fear of negative reviews is so not done, specifically if you are into business. You must be open to criticism as well as learning. Let your customers speak about their experience. Not only will it help you to refine your services, but it also offers a way to know the mainstays of your businesses. There might be products that you offer but don’t really appeal the users, or there might be products that do not offer the sense of quality that you wish to deliver. But letting you customers review them, you have a chance to improve and maintain a great repo with clients. Do not delete the negative comments after making the relevant changes to the products. Rather, interact with your customers. Reply to them while appreciating their time and lay out the steps to let them know they actually mean to you. Who knows? Looking at their value on your store, they might end up becoming your loyal ones. Wishlist is an amazing way to keep your users engaged. Assume a condition where it’s already month end. The salary is just a week away and customers are really looking forward to buying something exciting that they found on your website. That is, they definitely want to buy it, but not right now or probably once the salary is credited. That’s where wishlist feature helps you earn those extra brownie points by being a savior to your sales. Users can simply list the products they wish to buy here and ensure faster checkout when they want to. Wishlists are not just limited to this benefit. Imagine your buyer saves an elegant top to their wishlist. Now knowing their preferences, you can offer them with discounts on tops with similar patterns, or maybe an amazing pair of bottoms to match up with it. Okay. Let’s accept that. Too many choices make it all the more confusing to choose the best product for us. All we end up doing is comparing them against certain criteria we have and the buying the one that best meets it. Help your users get through this dilemma by adding Compare feature to your website. Allow them to add the products to check their features in a way that do not have to switch tabs frequently. Trust us, it’s help you earn a spot in the soft corner of their hearts. It does happen that we really loved one of the handbags that our colleague got another day and look forward to buying it. Or may be, you find an amazing dining set for your guests in a nearby mall, but would want to check it online rather. Shooting up queries on the Search Bar of e-commerce marketplaces really makes it exhaustive. You can rather help your customers by providing advanced search options. May be they can upload an image and offered with an extensive range of products you have. Give it a thought. Bonus Read: How to develop and eWallet Mobile App? Do you think customers who hate to wait in the long billing queues would welcome a virtual billing system that takes ages to process? Of course, NOT. To save yourself from getting to their hit list, simply let your website feature easier checkout options. Help them save details about their eWallets and cards to make their journey along the payment gateways smoother. Right from planning out the USP of your eCommerce website, there is a lot on the plate while pursuing e-commerce website development. While first-timers might already face the hardships, even more, it is not a smooth journey even for the ones who have been into the game for long. However, a great breather is basics remain the same. All you gotta do is, add a pinch of USP and mix in the ingredient called branding to help you business rule on the top ranks on Google. Before we move further, let’s dig a bit deeper into the key aspects to focus on while developing an eCommerce website for your business. Okay, what’s the entire of the point of business if you cannot really understand your market and offer plans tailored to its needs? It is very important to know about the market you are selling your products to. Brainstorm to understand the behavior and pattern of your target audience. Check their digital age to know their likes and disliked. All this will help you to find out what exactly your customers demand and how can your online marketplace best meet them. Prepare a list of the competitors. What makes them different? What makes their products stand out from others? What’s their business models? What features do they have? But hang on, it is not to be copied on your website. Rather, it helps you understand how customers behave to what. Once you are through to the ins and outs of your business, it’s time to understand what technology will suit you the best. Keep a strict eye on your budget and know the inventory. Make your choices for CMS, database, framework, and most importantly, the languages to code the backend and frontend of your application. Wondering why is technology stack that important? Read our blog here to get deeper insights. Smart branding tactics help you creating a lasting impression on the customers. Check out for the most recent trends in the web designing and ensure to give your brand the voice it deserves. There a plethora of choices for the users when it comes to eCommerce marketplaces. To make a long-lasting impact, you really need to stand out from the crow d and make intelligent use of features making a move. Following a customer-first approach while developing the features and ensuring a great user experience is the easiest way to retain your customers in long run. Make them feel that you really care for their experience and understand the issues they encounter while shopping at other online marketplaces. Only this way will you be able to have an upper hand over your rivals. You can make your journey more rewarding one by joining hand with an expert e-commerce website development company and simply leverage their time-tested experience. ← How to develop an on-demand flower delivery app?